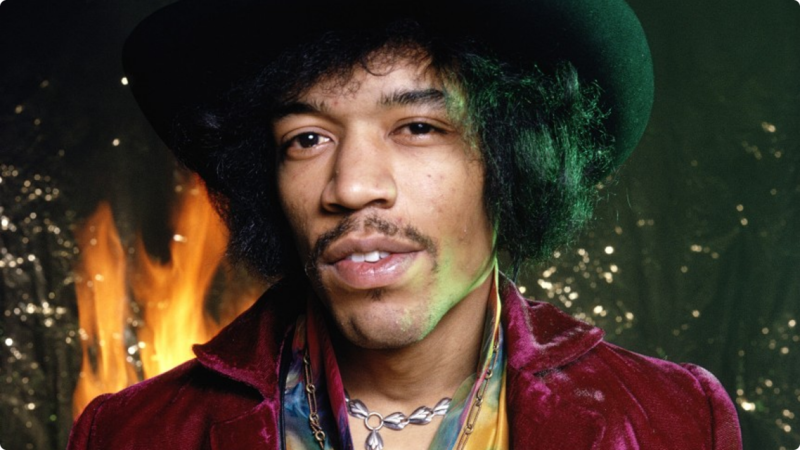 2015 marks the 45th anniversary of the death of the late, great Jimi Hendrix. Widely regarded as one of the most influential guitarists of the century and often cited as the “Voice of a Generation”, he started playing an actual guitar bought for him by his father for $5 at 15 years old, graduating from years of dreaming on the family broom. After a stint in the army (cut short when Jimi was injured during a parachute jump) he committed to the electric guitar full time. What must’ve seemed like bad luck for Jimi, was world changing for the music industry. Within months of scoring his first manager, Jimi had 3 UK Top Ten hits under his belt and was well on his way to becoming one of the most legendary musicians of, well, ever. After just four years as a global super star, Jimi Hendrix died of asphyxiation caused by an overdose of sleeping pills in September of 1970. Forty-five years later and tributes to the electric guitar legend come in all shapes and forms – from a sea of Hendrix masks at the Isle of Wight festival, to a poignant retelling of his work from folk aficionado Benji Kirkpatrick. Benji (of folk supergroups Bellowhead and Faustus) is a long term fan of Hendrix, his music leading Benji to the electric guitar which really solidified his passion for playing. Odd then, perhaps, that Benji leaves the instrument behind in his interpretation of the hits of Hendrix. Hendrix’s performances were well known for fusing feedback, fuzz and distortion – something you won’t find in Benji’s angle as he sticks to acoustic bouzouki, banjo and mandolin. It’s not a case of “Benji knows better”, this stripping down is done to reveal the genius of the songs beneath. Despite (or because of?) not being able to read or write music Hendrix was a fantastically intricate songwriter, and Bendrix is all about showcasing this. You can catch the show at Arlington Arts on Wednesday 23rd September at 8pm. Tickets are £12 and can be purchased here, or via the box office on 01635 244 246 between 10-4.30pm, Monday to Friday. All profits go to Mary Hare School for the Deaf.